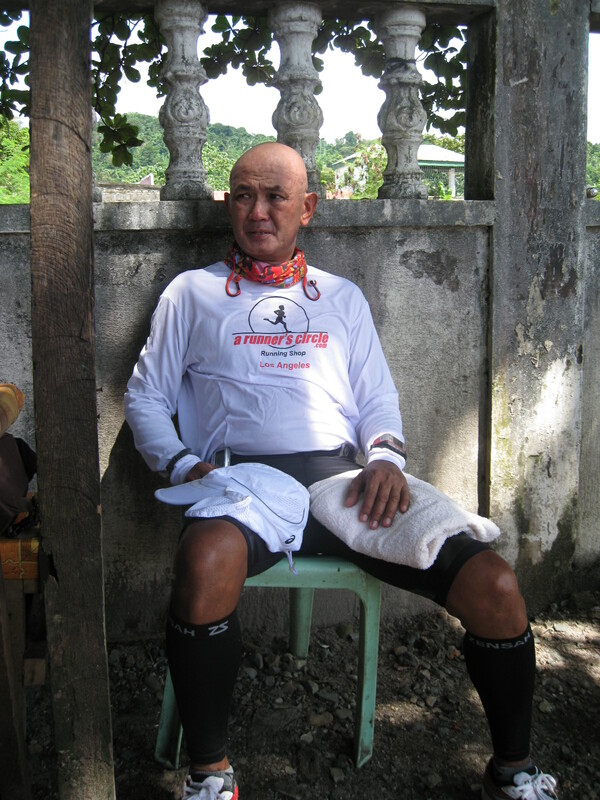 As you all know, I stopped this run after covering the distance of 40 kilometers after being bitten by an astray dog at the Poblacion of San Narciso, Zambales at around 7:40 PM of September 14, 2011, Wednesday. 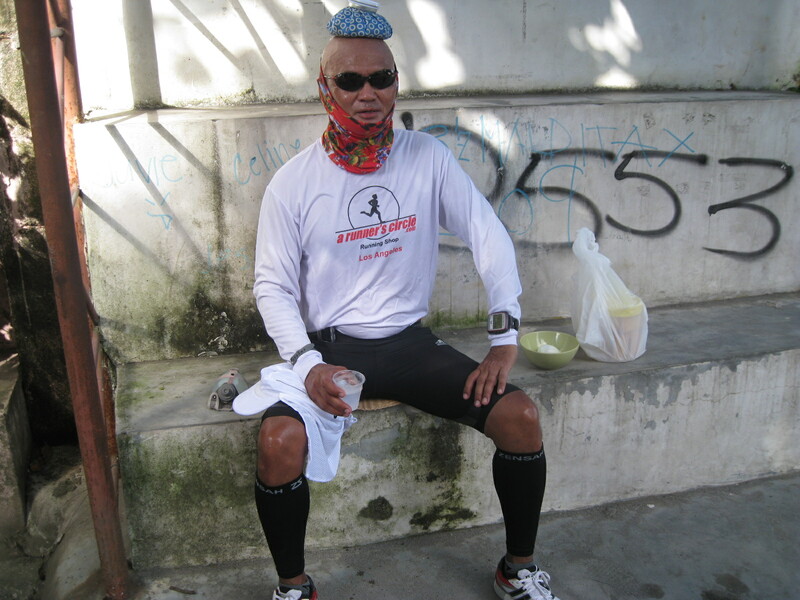 However, I would like to relate what transpired, in detail, from the time before I started the run up to the time when I reached the Poblacion of San Narciso. The day before I started this first attempt, I was having some problem with my stomach as I’ve been having a LBM for the past days and I was taking Loperamide tablets on a daily basis but to no avail, my condition did not improve. I was wondering if I had a stomach virus that was keeping me from being cured from such predicament. The solution that I could think of was to take a Loperamide tablet every time I have to eat and drink something few hours before I took off. Such move relieved me somehow. Once I reached the peak, I started my slow run in the descending portion. I was always on the left side of the road making sure that I can see what is infront of me. The road to Olongapo City was a busy one and I was very careful of the incoming traffic because the road was wet due to the brief rain in the area. My support vehicle was prepositioned in front of me in every 3 kilometers and I had to stop and cross the road to the other side in a careful matter in order to refill my handy Nathan “Sprint” Bottle and eat some solid foods. I was fortunate enough that the sun was covered with clouds for the first hour of my run. The first 4-5 kilometers was a “roller-coaster” where I strictly followed walking on the ascending portions and then running the descending ones. However, I have to regularly check on my Heart Rate Monitor Watch to be able to maintain a certain range of beats per minute. I made 135 bpm as my upper limit on my first 10 kilometers of the run. Along the stretch from Olongapo City to the town of Subic (actually I was surprised that there is a town named after the former US Naval Base/Facility) which is a distance of about 10 kilometers, I could see only two things along the road—entrance to the beach resorts and bold & colored names of night clubs/bars. There are also commercial establishments and cafes where you can see “senior white” guys drinking their coffee and smoking their cigar (not cigarettes!). A typical “Cool”-look of retired US servicemen who knew their way around in the country and in Subic/Olongapo area. They are good contributors to the economy of the place. You could just imagine how they could spend their monthly retirement pay with a business to manage, a young wife/partner, a nice house with maids, a nice car, and a beach/sea where they could relax. Such kind of life way back to their country of origin would be a fortune and luxury only for the rich and famous! It is along this stretch where I made my first status on Facebook, telling something about being “horny” while running on the hot and humid stretch of the Olongapo-Bugallon Highway and I received a lot of comments immediately after I posted it. Actually my feeling during the run was the complete opposite of what I’ve posted. I was trying to entertain myself and taking some positive vibes as the sun was already hot and it was noon time already. My hydration and nutrition strategy was strictly followed in order to last for the distance and I was feeling fine and strong. I have to rest in waiting sheds along the road and most of them are located on my right. After eating and hydrating myself, I have to open my laptop computer to find out if my Internet connection is strong. I was glad I was able to post a brief summary and some pictures about my run where the signal is strong. It took me at least 30-35 minutes for these “pit stops” and had only a few remaining minutes to complete my targetted number of kilometers in every hour of my run. 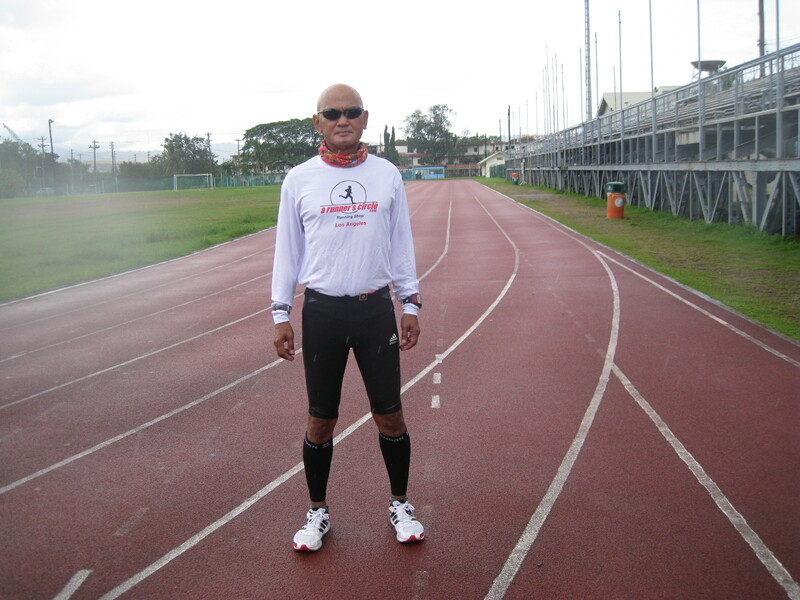 At least, I would be able to run or cover a distance of 5-6 kilometers per hour to include my rests/”pit stops”. For the next hours, this ritual had been repeated all the way as I covered more towns of Zambales. But I did not meet the required targetted mileage as hours passed by. 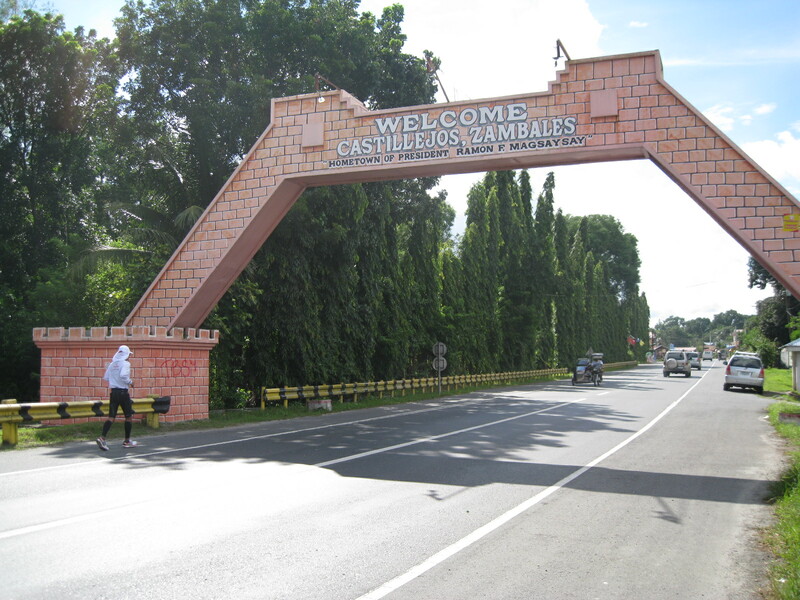 After Subic, the next place to go was the town of Castillejos, the birthplace of the Former President Ramon Magsaysay. The place is clean and it has paved sidewalks. I did not bother to pay attention that the preserved old house of the former President was on my side which I learned later on my next attempt. The next town would be San Marcelino, a big towm which serves as the meeting point/junction for the towns of San Antonio and San Narciso. If you turn left from the junction of the town near its Municipal Hall and Public Market, you would go along the Old Route that goes to the town of San Antonio but if you go straight, it will lead you to the new highway which is a “shortcut” to the town of San Narciso. This stretch of the Highway is wide, flat and with lesser traffic but the view of the ricefields on both sides of the road was very refreshing. On the east you would see the Zambales-Tarlac Mountains and the west would be endless sight of ricefields and some hills. 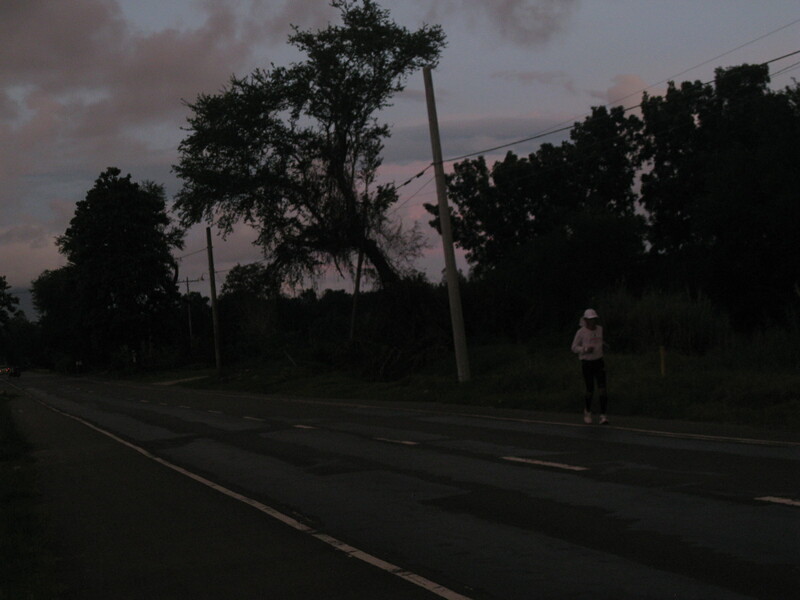 After my hourly “pit stops”, I was already on the boundary of San Narciso but I need at least 6 kilometers more to reach the Poblacion and it was starting to get dark. I had to use my Eddie Bauer Headlamp and hand-held flashlight to illuminate the ground about 2 meters ahead of me and I was comfortable with my run. 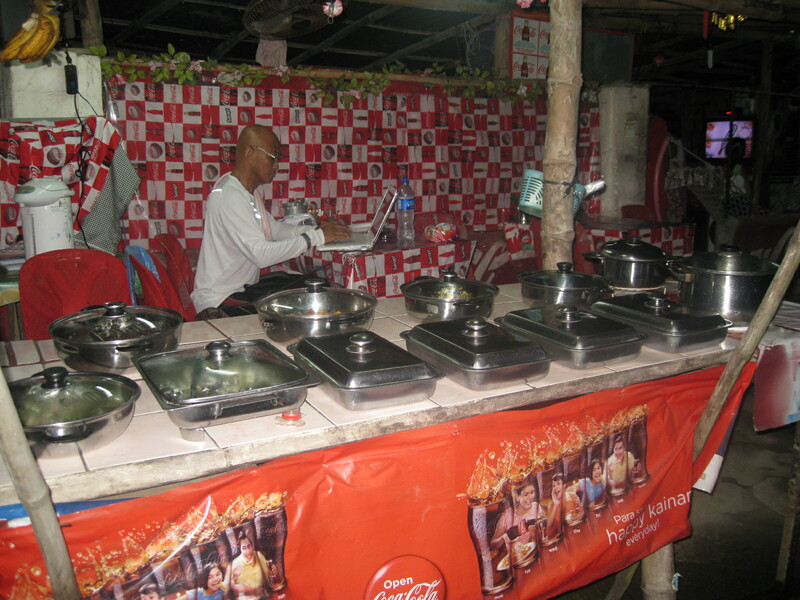 As I slowly reached the Poblacion of San Narciso, I told my support crew that we need to have a decent and “hot” dinner along the first eatery (carinderia) that we could reach. That would be my first complete meal for the day. I decided to pass on the first one because there was a loud Karaoke with an out-of-tune and out-of-beat singer/performer. The place is crowded, too! So, I have to stop on the next eatery where there is no customer. The owner of the carinderia was generous and kind that she allowed us to charge my laptop and heat up our electric thermos. For meals that cost us P 120.00 (rice and pork sinigang) and free use of their electricity for about an hour, it was something to cherish when you are in the province. I took some time to update my blog in this carinderia while talking to the owner and to the waitresses who happen to be the nieces of the owner. From our conversation, they were informed that I was running from Subic all the way to their place and hopefully end up in Iba, Zambales. (I did not tell them that I’ll be running further north from their province and end up in Alaminos, Pangasinan!). My first instinct was to stop on a lighted part of the road and see the wound clearly with my hand-held flashlight. I asked for some wet wipes from my support crew and immediately cleaned the wound as there was no blood coming out from the wound. One thing that I failed to prepare and bring was my basic first aid kit. This could be one of the reasons why there was something wrong in me! We had to rely on the services of an open drug store where we bought Betadine, Cotton and Bandage. After buying such medical needs, I walked to the Public Plaza where the park lights are stronger. I just sit on the steps that lead to the park while treating and cleaning my wounds. It was time to call the doctors whom I know. Not only one but three of them and they gave me identical recommendations and procedures to follow. After I dropped my phone, I immediately decided to stop the run and go back immediately to Manila for my immediate treatment. In less than 18 hours, I had my anti-tetanus shots first and then my first anti-rabies shots, not after going in 3 different branches of Mercury Drug Store. The anti-rabies shot is not being carried by all Mercury Drug Stores and they are very expensive! For a 1/2 cc of injectable drug that costs P 1,630.00, the company that manufactures it would be making a lot of profit. As of this writing, I was able to complete the required number of shots within 14 days after the 1st injection and the scars of the dog’s bite leave as a memory/souvenir of my first attempt to run the WC 200.